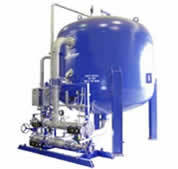 Anderson Water Systems is an industrial water treatment equipment manufacturer designing large assemblies and piping configurations. The company needed to expand its 3D design section by using an economical design solution that matched or exceeded the company's existing design capabilities. We chose SOLIDWORKS software because it was more economical than our previous 3D software and provided a more complete package than the other software we evaluated, including Solid Edge and IronCAD. We were impressed with the breadth and depth of add-on solutions available to us through the SOLIDWORKS Certified Gold Solution program. We also liked Dassault Systèmes SOLIDWORKS Corp.'s focus on helping engineers and designers to communicate with one another with tools like SOLIDWORKS eDrawings Professional. We also use the SOLIDWORKS Routing add-on module to create piping assemblies quickly, accurately, and with amazing detail. Using SOLIDWORKS, we were able to expand our 3D design department, adding two users who quickly have become proficient with SOLIDWORKS. Using SOLIDWORKS, we have surpassed our previous capabilities.